The latest interior trends for 2019 are here! Discover design trends to look out for at AGHA Melbourne Gift Fair. According to Darren Palmer, Moroccan and botanical looks will work beautifully in Australian homes. “The Moroccan look is exotic and luxurious,” he says. “Think bold brights, clashing patterns and earthy, rugged textures. 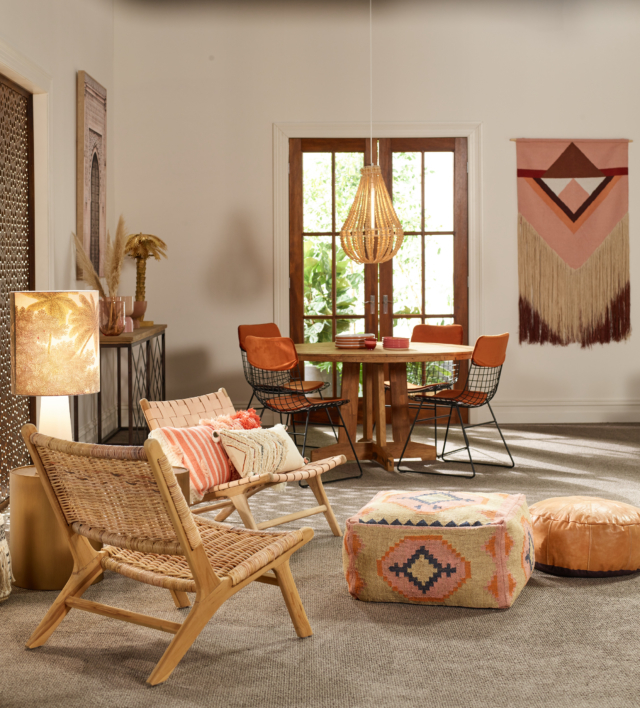 With its bohemian edge, this look brings a sense of energy yet warmth to a space. When you’re decorating a room, it’s always a good idea to start with the floor. It’s one of the largest expanses of space in a home and will set the tone for the rest of your furnishings. “Complete the look with a medley of bright, patterned rugs and cushions, buffed leather accessories, decorative pendants and woven wall hangings,” he says. The botanical trend works well with Australian homes with our love for the indoor-outdoor concept. It is all about bringing nature inside creating a fresh, relaxed look. “The key to making this look work is not to overfill the space―you want it to feel light and airy,” says Palmer.